This page type is ideal for presenting text and images formatted with sub-headings and paragraphs, providing a variety of information to your visitors. A Brochure page can have up to 25 Content sections that follow on from the Header. The options of each Content section are the same as the Header, allowing different combinations of photographs and text to be displayed on the finished webpage. 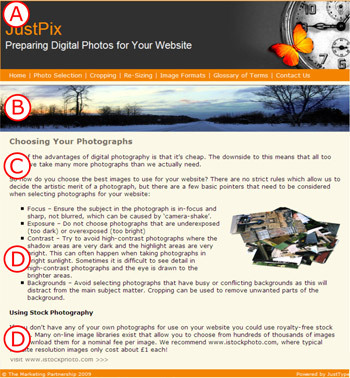 In the example below the Masthead (A), Banner picture (B) and Header (C) are followed by two Content Sections (D), the first with the text formatted as bullet points with an associated picture. The second Content section has no picture but contains a heading and a link to another website.